JCS “Concern “Sea Underwater Weapon – Gidropribor”, the State Research Centre of the Russian Federation, is the leading organisation in Russia engaged in creating marine underwater weapons and special purpose underwater equipment. The Concern implements the process-oriented quality management system certified by certifi-cation bodies accredited in the Government Standard Board to comply with the requirements of the State Standards ISO 9001-2011 and PB 0015-002-2012. Torpedoes - Development of torpedoes is an important activity of the Concern “Sea Underwater Weapon - Gidropribor”. Suffice it to say that almost all postwar Soviet and Russian torpedoes were developed by the Concern or with its direct assistance. Among the products are the light-weight antisubmarine torpedoes of 324 mm and 400 mm caliber, single-purpose (either antisub-marine or antisurface) and multi-purpose torpedoes of 533 mm caliber, and the world’s most powerful torpedo of 650 mm caliber. A number of the torpedoes have been supplied to foreign customers. The Concern-produced torpedoes are notable for their high combat efficiency, reliability, usability and high improvement potential. Sea mines - JSC “Concern “Sea Underwater Weapon - Gidropribor” develops the full range of modern sea mines including bottom and anchored mines, torpedo mines and rocket mines which can be used both as defensive and offensive capabilities in tactical, strategic and political missions. The Concern-produced mines can be used from any platform (surface ships, submarines and aircrafts) against different targets (surface ships and submarines). The Concern-developed sea mines are the intelligent weapon with high capabilities to meet both the mine-specified and unique challenges. Mine countermeasure systems - JSC Concern “Sea Underwater Weapon - Gidropribor” has developed and produced the in-fluence sweeps (IS) to be used successfully against bottom mines with proximity fuzes which response to the ship physical fields. The Concern develops two types of IS: classical IS and imitating sweeps (IMS). The fundamental difference between IMS and classical IM is that IM reproduces limited number of the ship physical field classification criteria in a broad swath, while IMS reproduces well greater number of the classification criteria but in a narrower swath comparable with a bot-tom-mine danger area. The classic ISs are used to sweep mines with known characteristics. IMSs are used to sweep up-to-date influence mines which implement complex processing algorithms to classify received signals and select the targets to be destroyed. Besides influence sweeps, the Concern has developed mechanical sweeps of different types - different-depth sweeps, bottom double sweeps, net sweeps towed by minesweepers, helicopters and air-cushion crafts. Along with the towed systems, the Concern has developed a lot of self-propelled remote-controlled (via a cable) unmanned underwater vehicles (UUVs) to perform a range of defence and economic missions. Acoustic countermeasure systems - JSC Concern “Sea Underwater Weapon - Gidropribor” develops and produces the multipur-pose hydroacoustic countermeasure systems to counter surveillance, detection and target desig-nation systems. The modular-and-unit design of the acoustic countermeasure systems reduces their build time and increases the maintainability. Also the Concern develops multipurpose hydroacoustic benches to test mine and torpedo systems. Unmanned underwater vehicles - The autonomous unmanned underwater vehicles (AUUVs) are rather new and intensive-developing branch of both civil and naval marine technologies. AUUVs are used extensively to explore and develop natural resources of the great oceans. 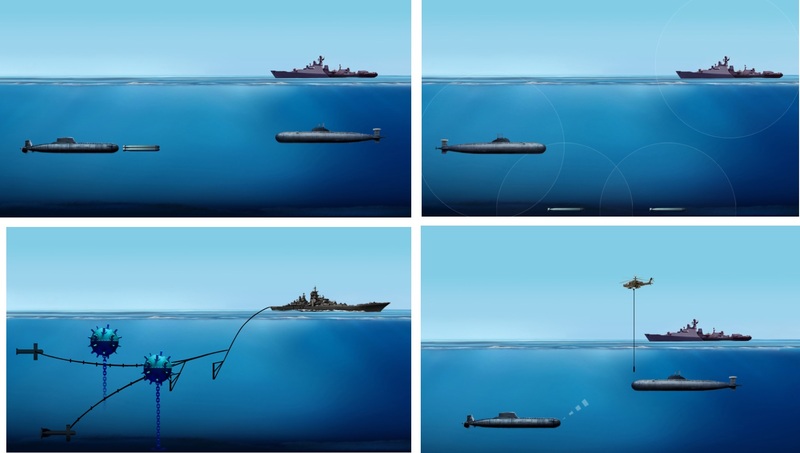 The combat use includes AUUVs application in areas risky or inaccessible for submarines surface ships and vessels. The Concern “Sea Underwater Weapon - Gidropribor” has the large experience in develop-ing AUUVs for civil and combat applications. The first civil-purpose vehicle was AUUV “Yantar” designed for underwater search down to 6000 m. The system was developed and put into service in 1991. Nowadays the Concern continues research works to develop next-generation AUUVs.